You’re trying your best to eat a healthy, well-balanced diet, but you don’t know enough about the elements that make up a healthy diet to make proper choices. Diet, weight loss and wellness are huge money makers so nutritional advice can sometimes be skewed to meet the needs or products of a particular company. This makes it even more difficult to find objective, honest nutritional advice. The 2010 Dietary Guidelines from the US Department of Agriculture promotes healthy eating with detailed nutritional recommendations anyone can use to plan healthy dietary changes. The guidelines were established to help promote overall health and disease prevention, but not all general guidelines are ideal for all patients. If you have a medical condition like diabetes, high blood pressure or heart disease, you need to follow the advice of your doctor in terms of dietary changes aimed at promoting personal health. Before following these dietary suggestions or dietary suggestions from any other source, contact your doctor to review the changes and ensure they meet your health needs. Carbohydrates are the energy source the human body prefers. Found in many foods and drinks, carbohydrates are more commonly known as starches, sugars and fibers. Plant-based foods contain natural carbohydrates, but food companies can also add carbohydrates to foods. For instance, cereals can contain high levels of fiber. This fiber does not naturally occur in the ingredients used to manufacture the cereal, so the company adds it to change the nutritional profile. Companies can also add starches and sugar to change the texture and taste of foods. Between 45% and 65% of total daily calorie intake should come from carbohydrates. If you’re eating a 2,000 calorie a day diet, that equates to between 900 and 1,300 calories or 225 to 325 grams of carbohydrates. Each gram of carbohydrates supplies four calories. Not all carbohydrates are created equal. Whole grains, green leafy vegetables and beans are ideal sources of complex carbohydrates and fiber. Foods that contain complex carbohydrates supply long-lasting energy and tend to have a stronger nutritional profile with tons of healthy vitamins and nutrients. Simple carbohydrates, like white flour and white sugar, metabolize quickly and provide few vitamins and nutrients. Simple carbohydrates also affect blood glucose levels much more quickly than complex carbohydrates. Protein is another source of fuel needed for optimal development and growth. Every cell in the human body contains a source of protein. While protein tends to be synonymous with animal products, many plants also contain a healthy source of lean protein. You should consume between 10% and 35% of your daily calorie intake from protein sources. That adds up to between 200 and 700 calories from protein per day if you’re following a 2,000 calorie-a-day diet. In grams, total protein intake should fall between 50 and 175 grams. Protein from plants should make up a large portion of your daily protein intake, but lean animal sources like chicken, turkey and dairy products are healthy alternatives. Seafood, rich in omega fatty acids, should be part of your diet two times a week if possible. Fat is the most nutritionally dense element of food. Every gram of fat provides nine calories, more than twice the number of calories provided by one gram of protein or carbohydrate. Some vitamins require fat intake for proper absorption, so everyone needs to consume a controlled amount of fat throughout the day. Total daily fat intake should range between 20% and 35% of your caloric intake. That means consuming between 400 and 700 calories from fat or 44 to 78 grams of fat based on a 2,000 calorie-a-day diet. Not all fat sources are healthy. Healthy diets should consist of unsaturated fat from lean foods like chicken, turkey and fish. Olive oil, nuts and canola oils are better than general vegetable oils. Try to limit intake of processed fatty foods like pizza, French fries, fast-foods and fatty protein. Saturated fats are considered unhealthy fats. Common food sources include animal protein and whole dairy products like whole milk, cheese and butter. Tropical oils, including coconut oil, are high in saturated fats. Medical research suggests diets high in saturated fats may contribute to increased risk of diabetes and heart disease. Ideally, saturated fat intake should be at or below 7% of your total daily calorie intake for optimal health and reduced risk of heart disease and diabetes. The upper limit for saturated fat is 10%, which means you should consume no more than 200 calories or 22 grams of saturated fat based on a 2,000 calorie diet. Saturated fats should be replaced with healthy fat sources like olive oil, avocado, nuts and seeds. The nutritional recommendations for saturated fat are part of the total recommended daily fat intake. Trans fat is a natural and artificial type of fat. Some animal products contain trans fats, but with the influx of processed foods in western diets, the main source of trans fat tends to be hydrogenated oils. 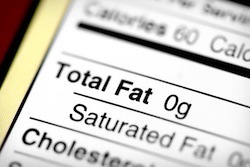 When saturated fats are hydrogenated, trans fats are produced. Trans fats are known to increase the risk of heart disease. Trans fat intake should be eliminated from the diet whenever possible. If elimination is not possible, limit intake to no more than 2 grams of trans fat per day or a maximum of 1% of total daily fat intake. Processed food, fast food, desserts and snacks tend to contain trans fats, whereas plants and lean animal sources tend to be free of trans fats. Cholesterol, though plagued by a poor nutritional image, is actually necessary for health and well-being. The body uses cholesterol to form cells and produce some hormones. However, all the cholesterol the body needs to complete these functions is made by the body, so dietary intake is not necessary in a healthy diet. Consuming too much cholesterol can contribute to increased risk of stroke and heart disease. Common sources of dietary cholesterol include animal meat, eggs, butter and other dairy foods. Ideally, cholesterol intake from dietary sources would be eliminated from a healthy diet for optimal health, but some of the foods that contain cholesterol also provide healthy vitamins and macronutrients like protein and carbohydrates. Restrict cholesterol intake to no more than 300 mg per day. Intake of less than 200 mg per day may be suggested for patients at increased risk of heart disease. Fiber is a form of complex carbohydrate found in plant-based foods. The human body cannot digest or absorb fiber. The two forms of fiber are insoluble and soluble. Insoluble fiber is commonly found in green, leafy vegetables, whole grains and bran. It contributes to bulk waste and helps keep the elimination system moving. Soluble fiber, found in beans, fruits and vegetables, may help control blood glucose response and reduce cholesterol. Men should consume at least 28 grams of fiber daily, while women have a lower recommended intake of at least 22 grams of fiber daily. More fiber is better, but a gradual increase in fiber intake is crucial for comfort as fiber can cause gas and bloating. Whole grain foods, fiber-rich fruits and vegetables and beans are great natural sources of fiber. Sodium is a mineral found naturally in some foods, but most western diets are rich in added sodium, not natural sodium. Sodium is required for basic body functions and maintenance. It helps balance body fluid levels, move nerve transmissions and aids in the natural contraction and relaxation of muscle fibers. Sodium intake must be maintained within healthy limits because too much or too little sodium can be deadly, in extreme cases. If you are under the age of 51, you should consume 2,300 mg of sodium or less per day. Over the age of 51 that nutritional recommendation drops to no more than 1,500 mg per day. People of African-American decent and patients with a history of hypertension, diabetes or kidney disease should also follow the reduced nutritional recommendation for sodium. Sodium is widely found in processed and canned foods. Limit consumption of these foods to reduce dietary intake. Some whole foods, especially meats, may be injected with sodium solutions for taste and preservation, increasing total sodium level. Skip adding salt to recipes or meals to further reduce dietary intake. Sugar is a form of carbohydrate found naturally in many foods like fruits, vegetables and dairy products. There are multiple kinds of natural sugar, including fructose (fruit sugar) and lactose (milk sugar), but there are also other types of sugar like cane sugar and corn syrup that are added to foods and drinks to improve taste. Added sugars do not provide any nutritional benefit, but they do increase the amount of calories in the food or drink. Each gram of added sugar adds four calories. Based on a 2,000 calorie diet, men should consume no more than 150 calories of added sugar and women should consume no more than 100 calories of added sugar per day. These calorie limits add up to no more than six grams of added sugar for women and nine grams of added sugar for men per day. This does not include the natural sugars found in fruits, vegetables and dairy products. Patients with diabetes may need to follow stricter guidelines for added sugar intake, with added guidelines for general carbohydrate intake, based upon personal dietary needs.